NEW BAND TIPS FOR SUCCESS IN MUSIC! - Do you want to get your music out of the basement or garage and onto real stages? - Do you want straight-talk on how to get started fast & really get ahead in your music career? - Would like to get a leg up on the tons of other bands you're competing with right now? - Could you benefit from practical tips & strategies to get your name out there today? - Could you use practical advice on keeping a band together while still keeping it profitable? You've learned how to write and play your music... now you HAVE to learn how to SELL it! You believe in the talent, the music & the passion... what do you now need to be thinking about and DOING to really start to succeed with your music? You know the music... now you need to learn "the business" of indie music marketing, sales, and promotion! 1. If you're a beginning band, artist, or musician... this information IS for you! The products and resources here are music-business-related tips, insights, strategies, and considerations for new(er) bands, artists (and their supporters) who are just starting out. 2. If you've been around awhile and think you know it all already... this info is NOT for you. NewBandTips.com = tips for "young" bands/artists interested in indie music success! 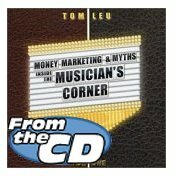 Tom Leu's Musician's Corner® books at www.NewBandTips.com are insights and considerations for new(er) bands and groups that have little experience and want to get started quickly and on the right foot. The "tips" aren't necessarily new, because the principles required for success in music & business haven't changed much. It takes talent, tenacity, and timing in that order to "make it." Uncommon success = common sense applied! So who again, is this NewBandTips material for?? A) Bands, artists and musicians who realize that while they may be good musicians, they aren't (yet) the greatest marketers of their music. You have to be good at both the music AND the business of the music business to really get somewhere, anywhere. B) Parents, friends, relatives, supporters and managers who think they know the next American Idol or The Voice, etc.? If you know someone you believe has what it takes to succeed in music, do you - do they - really know what it takes to "get your music out there?" Do you all understand the many, many nuances required to...? 1. Create a compelling artist - a superstar act who commands attention? 2. Produce provocative music - world-class tunes that evoke a reaction/response? 3. Incorporate relevant marketing strategies - smart actions that get you noticed & booked? REALITY CHECK: Most unsuccessful musicians and bands deserve to be... that's right, the vast majority of indie musicians simply aren't good enough at BOTH aspects necessary for a successful music career... the MUSIC + the BUSINESS! Harsh? Mean-spirited? Not if it's true. And the truth is... most independent musicians aren't living in reality when it comes to 1) honestly evaluating the quality of their music nor 2) effectively marketing & promoting their music ongoing. Free Tip #1 - get objective feedback from experienced producers, songwriters or industry pros regarding the overall quality of your music (No, your Mom, your girlfriend and your buddies aren't objective). Free Tip #2 - swallow your pride, admit that you might not know everything about this subject, and start learning all you can about marketing and selling yourself and your music better than your competition. What you will NOT find in this book and audio program... Inflated stories about tour buses, top ten singles, gold records, or music videos. It is also NOT written with confusing legal jargon around circumstances you may never find yourself in. MONEY - how to make more of it as an independent artist! MARKETING - how & why to sell yourself first, your music second! MYTHS - what you don't know, you don't know, about the music biz! "Tom Leu is a dedicated and passionate believer in the concept of 'the well-rounded musician.' Any musician who adheres to Tom's enlightening words will realize a career in a band takes more than being a great player, and will make a point of becoming well informed on the business aspects of music, will learn to be a strong collaborator and a team player and, as a result, will be a success!" Award-winning songwriter and author of "The Art of Writing Great Lyrics" and "The Art of Writing Love Songs"
"It was a pleasure having Tom speak to our CD Baby Members in Chicago. His book, Money, Marketing, & Myths Inside the Musician's Corner is a great resource for artists at all levels of the music business. Being a musician himself gives him more credibility than most of the people who write books about the industry. If you want to make it in this business as a musician, you need to read Money, Marketing, & Myths inside the Musician's Corner. Everyone in attendance enjoyed his presentation and Q&A. We can't wait to invite him back!" The messages contained throughout the Musician's Corner® audio book deliver a "reality mentality" by blending honesty with inspiration; the practical with the positive. I'm blunt up front but always end with encouragement. This material is not for the unteachable... I don't want to talk to those who are jaded and jilted; the negative nay-sayers who think they know it all. If that's you, this 'aint for you. This material is for those who are willing to learn and eager to get honest about this business of music that they are into. These resources are for those who are passionate about making progress with their music by investing time in the subtleties of success that any business requires, but are often over-looked. I am not here to talk about playing music, I am here to talk about effectively selling yourself and your music once you already know how to play. I am not here to teach you how to play a "C" chord, I am here to make you "see" the realities required to become a successful independent artist or group. If you prefer reading and want this information immediately, you can purchase the Musician's Corner® 56 page e-book right here, right now for just $7.99! This is the exact same information that is on the audio CD only in an e-book format available for instant download to your computer. If you prefer to download the CD tracks right here, right now, you can download the complete Musician's Corner audio book in MP3 format for just $9.99 through iTunes. All 26 tracks and 77 minutes of the Musician's Corner® are instantly available... just without the cool CD packaging. So who am I? A veteran musician/manager who tells the truth to up-and-coming bands, artists and musicians. I bring over 25 years of experience & knowledge about the rock-n-roll band business! And I want to share it with those just starting out... to encourage you to apply the tips while simultaneously avoiding the traps. Tom Leu is an author, speaker, musician, and media personality from Rockford, IL. Tom's talk shiFt motivational resources and live presentations blend the insights of teacher with the encouragement of a coach delivering electric inspiration that empowers potential!